Years before Patrick arrived in Ireland, Saint Declan was the Bishop of Ardmore. As an ancient Saint, there are few details of his life, except that he was a model for generosity. It is said beggars followed him wherever he went. We also have many wonderful remains where Declan lived in Ardmore. There is a beautiful round tower, the ruins of a cathedral, and a second church beside a holy well. There is also primitive oratory and some inscribed pillar stones. His feast day is July 24. Declan, an Irish monk, was baptized by and a disciple of Saint Colman. He appears to have been an Irish evangelist before the arrival of Saint Patrick. He may have made two pilgrimages to Rome and later became the first bishop of Ardmore, a see confirmed by Patrick during the synod of Cashel in 448. Many miracles are attributed to Declan, who is much honored in Dessee (formerly Nandesi). St. Declan, son of Erc, chief of the Desii, was born at the beginning of the fifth century near Lismore, Co. Waterford. As a young boy he was sent to fosterage with a certain Dimma, who is said to have been a foreigner and a Christian. While under Dimma's guardianship, Declan was converted and baptized by one of the several Irish saints named Colman. After leaving Dimma, Declan went to Rome, where he studied for the priesthood and was later consecrated bishop. On his return to Ireland, he established a monastic community at Ardmore and was later confirmed in this office by St. Patrick himself. 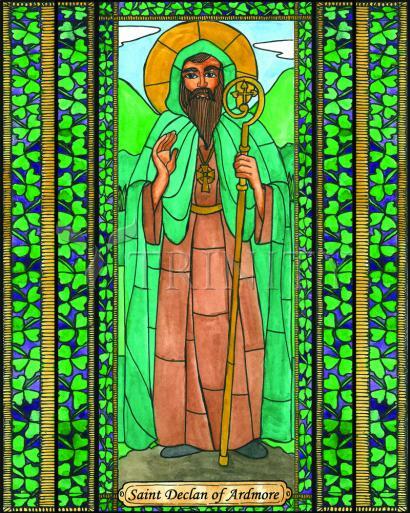 Declan was well known as an active missionary in Ireland prior to the coming of St. Patrick, the great organizer of Irish Christianity. The waters of St. Declan's well (which was restored in 1951) are said to possess miraculous powers of healing. Those who suffer from sprains, injuries or rheumatism, it is said, will obtain relief by bathing the injured limb in its cool waters. Each year, the week including his feast day is known as “Pattern Week.” Pilgrims still come to pray at the site of Declan's church on the headland of Ardmore, adjacent to the round tower which is in an excellent state of preservation.